All of temari-making is based on marking the surface of the mari into an arrangement of spaces. Most often it will be into one of the 3 Standard Divisions: Simple (Tanjyun toubun), 8-Combination (Hattitobun no kumiawase) or 10-Combination (Jyuttoubu no kumiawase). Traditionally, divisions are created by using a thin paper strip and relational geometry to segment the ball in very specific ways according to the laws of nature (physics & geometry). The Standard Divisions are the only ways that centers or poles can be evenly distributed with 3-dimensional symmetry on the surface of a sphere (that is, the spaces between and the angles between the points are equal). It's not some engineering feat that was invented but rather that humans observed and learned how to use these naturally occurring happenings. The temari makers of old, hundreds of years ago, recognized these patterns in nature and found ways to reproduce them just as artisans and craftsmen through the ages have observed the world around them, and harnessed its knowledge. Using the paper strip to determine relative distances on the ball, pins are used to place landmarks on the mari for such points as the north and south pole and the equator, which are then connected by wrapping thin thread around the ball. Each of these wraps of thread must, and does, go fully around the circumference of the ball, so that any one of them would divide the ball into hemispheres. Such a line of thread is called a division line. Collectively, the thread lines placed on the mari are called jiwari. There are many times when additional marking lines may be placed on the mari, but they are just that: marking lines, not division lines, since they do not meet the criteria described above in terms of function and outcome. Additional marking lines may further subdivide sections into smaller sections, etc. It is important to remember that all division lines are marking lines, but not all marking lines are division lines. Areas outlined by marking lines are called mentai in Japanese. While there is no limit to the number or manner that extra marking lines can be applied thus creating extra mentai, there are some extra mentai that are more commonly used. The primary division of temari is the Simple/Vertical Division (either term can be used interchangeably). The Simple/Vertical division divides the mari simply, or vertically, into wedges from north to south (like an orange), with a perpendicular equator at the midline. In addition to being used as is to create designs, it is also the division from which the other two Standard Divisions evolve. A north and south pole is achieved, and the equator identified. Thread lines are then wrapped around the full circumference of the mari, going from north pole to equator to south pole to equator, back to the north pole. This is repeated the required number of times for the needed Simple # Division. The equator is always laid down in a Simple Division unless the pattern states otherwise. For example, if one were creating a Simple 4 Division: divide the equator into 4 equal sections (mark with pin). Anchor the thread at the NP, wrap to a pin on equator, continue to SP, then to pin opposite first equator pin, and back to NP. 2 full circumvention wraps around the mari has divided it into 4 equal, 3-D symmetrical sections (or wedges). A thread is then wrapped around the middle, perpendicular to the vertical threads, as the equator. In the example in the photo to the right, 8 sections were created. Thus, the completed division is a Simple 8: use the number of sections created in the division to name it. Any number of vertical sections can be created in a Simple Division, be it odd or even. One need only be able to section the equator into the required number. Once the simple division is accomplished, it can be used for stitching or as the basis to advance it to a Combination Division. It's also important to note that designs stitched on Simple Divisions need not always be considered "simple". Many beautiful and intricate designs can be created on Simple Divisions, as well as it being the starting place to learn temari. A Combination Division (Kumiawase) is begins with as a simple division, but then has additional poles of the same value as the starting Simple Division "combined", or added onto it, such that the centers or poles are equally spaced around the ball (that is, both the distance between them is equal, and the angles that form between any three centers are equal). This can only be accomplished, according to the laws of nature, to create an 8 Combination (often abbreviated C8) from a Simple 8, and to create a 10 Combination (C10) from a Simple 10. An 8-Combination Division has additional 8-point centers added on, for a total of 6, all equally spaced around the ball. A 10- Combination division has additional 10-point centers added on to it, for a total of 12, all equally spaced around the ball. These basic, unique divisions are the ones accepted in Japan and taught by the JTA, have come down through temari history, and also that meet geometry and math requirements. A division is an execution that divides the mari into 3-D symmetrical, geometric shapes using marking lines that go all away around the circumference of the ball; the smallest shapes created are all the same; these lines result in evenly spaced intersections (poles), each with 4 or more angles around them ( the same number of angles created in the original simple division). Being able to execute these standard divisions are the skills that one is expected to learn as a temari crafter. Remembering the difference between a marking line and a division line, while there are 3 standard divisions, there are an infinite number of markings. Beyond the standard divisions, any other needed marking lines are usually specified and directed in individual patterns. Some of them are more common, and have evolved nicknames of their own, but always remember that they are markings, not divisions. Understanding these standard divisions and being able to recognize them (for example, a Simple division has 2 main poles; a C8 has 6 main poles, and a C10 has 12 main poles) is the absolute foundation of being able to look at a temari or illustration, and begin to "see" how to re-create the pattern, write up pattern notes and directions, create your own patterns. There are of course, many (many!) modifications of these divisions, that are accomplished by adding extra marking lines and/or sometimes removing some marking lines. These modified markings however, still start with one of the basic divisions listed above, rather than their own, unique technique and are not geometrically unique by definition. You may see isolated, special "divisions" described in a particular pattern, but it really turns out that any one of these really starts with one of the unique basic divisions, which then has specific marking lines added or removed from the original division. And yes, it is possible to lay down "random" marking lines that are not creating a division but DO create a stitching grid; again, this is a marking, not a division. 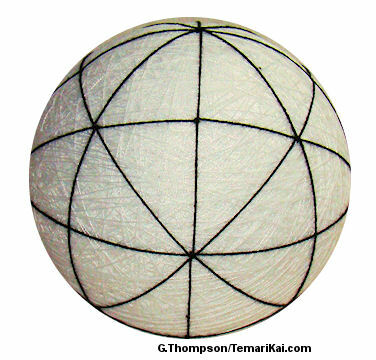 Mastering the standard divisions is the first and major step in learning to make temari. It's not difficult, given there are only 3; one is not expected to have a working repertoire of markings committed to memory, but they are expected to master and use the standard divisions. Each of them have their unique & traditional method method of placing the pins needed for the centers; there may be more than one method to lay down the thread lines. Shortcuts are fine - as long as there is an understanding of what the outcome is, and why - recognizing the shapes and layout on the mari in the end, and seeing it as a standard division. Diagrams of divisions can be downloaded from the Pattern Grids page.